ReefNews has some exciting new pictures for you this schoolyear. The ReefNews staff had an excellent adventure on the island of Bonaire this summer, and we're pleased to show you some of the site in Volume 6 of our newsletter. 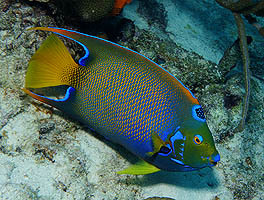 The Queen Angelfish is one of the most spectacular of all the reef fish. Click here to learn how ReefNews got this great shot of this bashful Queen Angelfish. A dive isn't over 'til it's over. 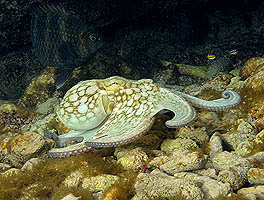 Click here to learn how the ReefNews photographer almost missed this spectacular Common Octopus in two feet of seawater.